This is Holy Week, and also we’re still in the Season of Lent – the period of 40 days prior to Easter Sunday. It’s about time to, once again, remind ourselves of the cross and all that it stood for. We do not know for sure who wrote the book of Hebrews – some say Paul, but there’s no certain evidence to support that claim. Besides, its style is different enough as compared to the recognised epistles of Paul – it begins as an essay, proceeds as a sermon, and ends as an epistle. Regardless of who wrote the book of Hebrews, it remains a book filled with doctrine and depth, and is regarded by many as a challenging book to read and understand. Who is Jesus? This verse gives us a brief summary of the life of Jesus – the role of Jesus, the purpose of Jesus. the author and the perfecter of our faith – What do we call this faith? Christianity. We are Christians. We follow Christ. Who is Christ? Jesus, of course. When we say that Jesus is the father of the Church, we mean it – he started the Church movement through his apostles whom he left behind for us. Through his ministry, we see numerous examples of this faith being lived out and perfected. A perfecter of the faith likely refers to somebody who has been there and done it. Like a perfecter of a certain sword style, Christ is the perfecter of this faith. who for the joy set before him endured the cross – This was said so gently, so casually, so simply in these mere words – endured the cross – but reading the gospel books we know how hard it really was and how painful the entire process was. This is Holy Week, and there’s always no better time than this to reflect and meditate over the entire process of the crucifixion. It was painful, no doubt. It was humiliating, no doubt. It was something that none of us would ever want to go through, something that none of us would ever need to go through, since he has gone and done it for us. We don’t need to be crucified, because he took our place already. Yesterday I was told that, yes, although believers in general do have a harsh road to walk, and there are plenty of difficulties and suffering in store, but because of Christ, the suffering that we face, though immense, is only temporary. It is a direct contrast to the eternal suffering that we believe non-believers will face. Look at the joy set before us, and let us learn to, like Christ, endure our immediate suffering. scorning its shame – it may be a little hard for us, people of this time and age, to perfectly understand the depth of the significance of this phrase – there’s a certain awesomeness and honour attached to crucifixion today, because it’s simply not a thing of our era. Yet in those days, crucifixion was the worst way to die – it’s not just public execution, where they behead you in public, it’s worse than that. Think about the nature of the crucifixion. First you have to carry your own cross all the way uphill, then you’re nailed onto the cross for everybody to see. This is death by bleeding via the holes plunged by the nails, yet it is a slow and painful death, while everybody savours it by watching. After a while, if you are not dead yet, they remove the nails on your feet, so that the weight of your body tugs on the nails of your hands, your wounds become bigger, and you lose more blood, quickening your death. After some time, if you’re still not dead, the soldiers will come and pierce your sides. And if you’ve long been dead, then your dead body will be left there until Sabbath – left there for all to see, to scorn, and to mock. That is crucifixion. A horrible way to die. As men we all know we will one day die – but there is a difference in being murdered and slaughtered versus dying peacefully with all your family around you because of old age or illness. There is a huge difference. Jesus died, bearing on the shame of his death, scorning the shame of his death. There are many times when we might be forced into shame because of the gospel, but let us not be ashamed – neither of our Lord Christ, who was born in a stable and died through crucifixion, nor of our gospel [Rom 1:16]. and sat down at the right hand of the throne of God – Christ was eventually rewarded with the highest honour, and one day, we will be amongst the courts of the Lord as well – we won’t be sitting at the right hand of the throne of God, for that belongs to Christ, but we will be amongst them, rejoicing and rewarded. The shame of the crucifixion was fleeting. The reward of the Lord is eternal. 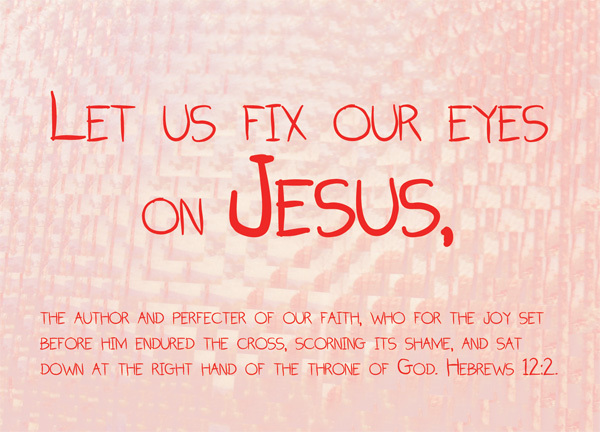 Let us fix our eyes on Jesus – Would you not look to Jesus? Would you not look at Jesus? Would you not cast your desperate glance on Him, in fear that you’ll lose sight of him? What a man! We only need to look to him. We only need to fix our eyes on Him and not get distracted by anything else in the world. It is Holy Week – not that we should be crying because Jesus died, and it’s not quite the time yet for us to rejoice because he lives – we have more than enough time to do that once Sunday comes. Indeed, why was Good Friday called Good Friday? I don’t know – it probably wouldn’t take me more than a google search to find out why, but isn’t it curious? Christ died on Friday. Christ was crucified and humiliated on Friday. To us, it should be a not-so-good Friday. The world loves Fridays – ever heard of TGIF (Thank God It’s Friday)? But why is it good to us? I don’t know about you, but I can only think of Friday as good only if I think about Sunday. Because we are Christians, we believe that after Friday, Sunday will come. If Sunday never came, and Christ was never revived, I don’t think I can accept Good Friday being called Good Friday. Friday changed a lot of things. That one Friday 2000 years ago, it changed many things. Because of that Friday, our sins were redeemed. Because of that Friday, we gained the ticket to salvation. These reasons make it a good Friday to me. I’m sure there are many other reasons why the day of the Crucifixion is considered a Good Friday. Let’s keep meditating for the next couple of days. Fishermen disciples. I’ve never really thought about them like that. ^^ Thank you. And though I know not what you’re going through the the extent of the burden you have to bear, keep the faith. God be with you!